The Ark of Sweets closed May 27, 1978. It was on West High Street and later in a building in the northeast quadrant of the Public Square. 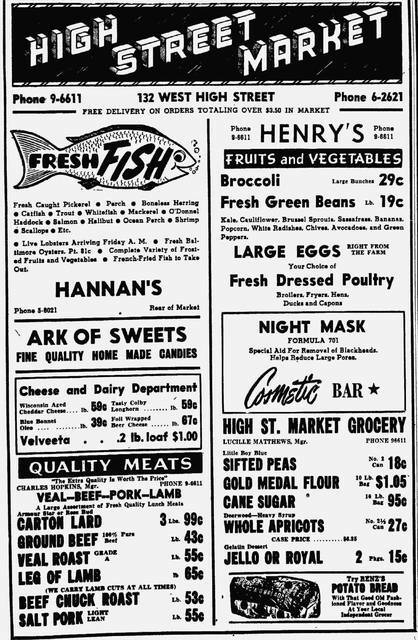 This newspaper advertisement from 1948 promotes the High Street Market and the Ark of Sweets’ “fine quality home made candies.” The shop was in the market. 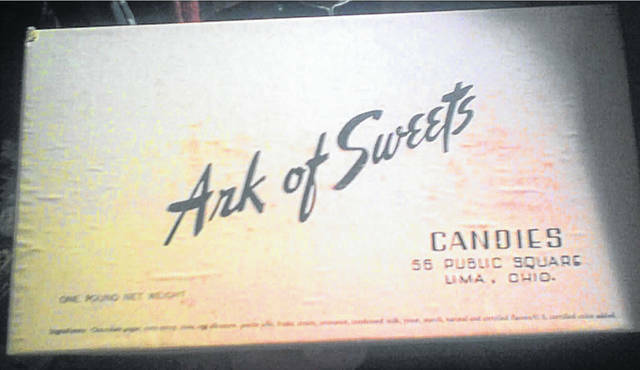 A one-pound box of chocolates from the Ark of Sweets. 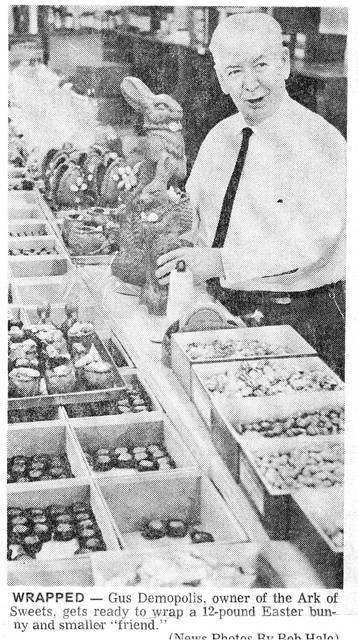 Gus Demopolis is pictured in 1967 wrapping chocolate Easter bunnies with more of his offerings in the foreground. LIMA — In the summer of 1948, Gus Demopolis moved his candy store from West High Street into a building in the northeast quadrant of the Public Square he had purchased four years earlier. Nearly three decades later, the Ark of Sweets maintained a comfortable sameness; downtown workers still enjoyed sandwiches at the long lunch counter and in the small dining area, while candy, hand-crafted on the second floor, was sold in the gleaming display case downstairs. But outside much had changed. Gone were most of the department stores that drew crowds downtown. Gone was the hulking Lima House Hotel, a 19th century relic that dominated the northeast quadrant of the Square and was a favorite haunt of oil men during the boom days and of pigeons in later years. Gone, too, were the Ark of Sweet’s neighbors, businesses like Mark’s Clothing, Stone’s Grill and the Arthur Murray dance studio. Gus Demopolis, too, was gone. 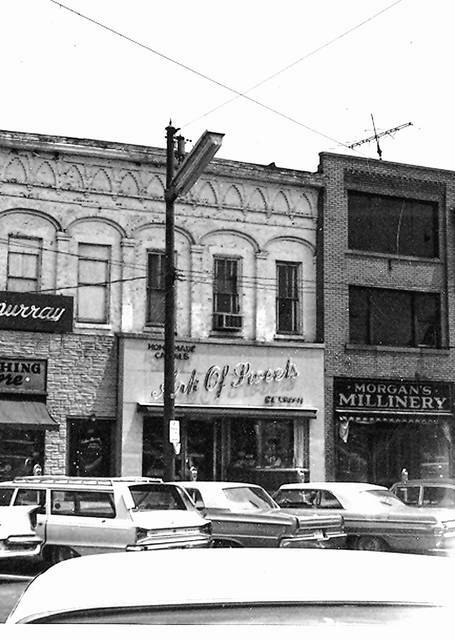 The Greek immigrant, who had arrived in Lima via Detroit and opened the Ark of Sweets in the 100 block of West High Street in 1936, died 1973 at the age of 78. His widow, Helen, had been running it since then. Fittingly on Christmas Eve of 1976, a News reporter visited the Ark of Sweets. “It’s a relaxing atmosphere,” the reporter wrote, “a place where old-fashioned Coke glasses are for real, not the imitation reproductions of today. The soda fountain still works, and hot fudge and caramel sauce is home-cooked by Mrs. Demopolis. However, the reporter warned, the Ark of Sweets “may no longer be standing by this time next year,” adding that the city, as part of its downtown redevelopment plans, was trying to acquire the building and demolish it. The Ark of Sweets survived for one more Christmas, but in May 1978, Mrs. Demopolis, after doggedly resisting the city’s efforts for several years, finally relented. On May 27, 1978, the Ark of Sweets closed for the last time. Although it’s been more than 40 years since that day, the Ark of Sweets is still a vivid presence in the memories of many Lima residents. Some can look at the glass-fronted Lima Municipal Center, which now occupies the northeast quadrant of the Square, and see the Ark of Sweets. Others are a little hazier on exactly where it stood, other than somewhere in the Square. All of them, however, have favorite memories to share in cyberspace. Some had aunts or mothers or cousins who worked there. Many remember regular visits there following shopping expeditions or trips downtown to see a movie. Mostly, though, they remember the things they ate there — hot caramel sundaes, cherry Cokes and French fries. There were Easter baskets with a solid chocolate bunny in the middle, boxes of chocolates with each chocolate marked to show what was in the center, cinnamon candies and so many more. Demopolis was born Nov. 4, 1894, in Lionidio, Arkadia, Greece, the son of Tom and Stella Spilos Demopolis. The family immigrated to North America and another son, Ernest Jameson, was born in Vancouver, British Columbia, in 1915. He changed his last name to Jameson — the English equivalent of Demopolis, according to the News — when he became an American citizen. By 1920, the family was living in Detroit, where Demopolis learned the candy business. Around 1935, Demopolis moved to Lima and opened the Ark of Sweets at 132 W. High St., offering “fresh and pure home-made candies,” according to a News ad from 1937. In 1950, Demopolis expanded his family and his business. In September her married the former Helen Smiley and in November he and his brother opened an Ark of Sweets candy store on the ground floor of the National Bank Building. In May of 1951, the brothers were put in charge of the soda fountain in the new First Lima Drug Company store on the southwest corner of Elizabeth and Market streets. Ernest Jameson left the business around 1954 and eventually settled in Dayton where he died on March 5, 1997. Gus Demopolis operated the store until his death on June 27, 1973. His widow Helen kept it open for nearly five years after his death before selling it to the city. Speaking to the News reporter on Christmas Eve of 1976, Mrs. Demopolis revealed the simple recipe that made candy from the Ark of Sweets so memorable. “Gus was a perfectionist,” she said. “If a batch of candy wasn’t just right, he’d start all over again. He had such patience.” Helen Demopolis died on June 28, 2006, at the age of 93.